For anyone who tracks their net worth and/or investment portfolio … I’m sure December (2018) was a tough month. It was certainly one of the biggest drops in net worth that my wife and I have seen … since we started keeping track of it back in March 2015. Despite dropping by over 4% since last month, growing our net worth is still part of our financial independence (FI) plan. To put things in perspective, we still grew our net worth in 2018 by just over $4,000. That’s not a ton … but still a move in the positive direction after a crappy end to the year. And on another bright note … we were able to reduce our liabilities by just under $16,000 in 2018. Remember that lowering our liabilities (or debt) is just as important as growing our assets when it comes to building wealth. Just trying to offer a little motivation after a rough couple of months! 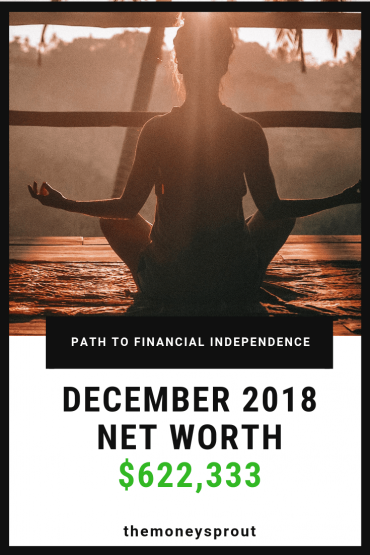 Before we move on to reviewing our December net worth numbers, I would like to mention how we are using our Personal Capital account to do most of the work. 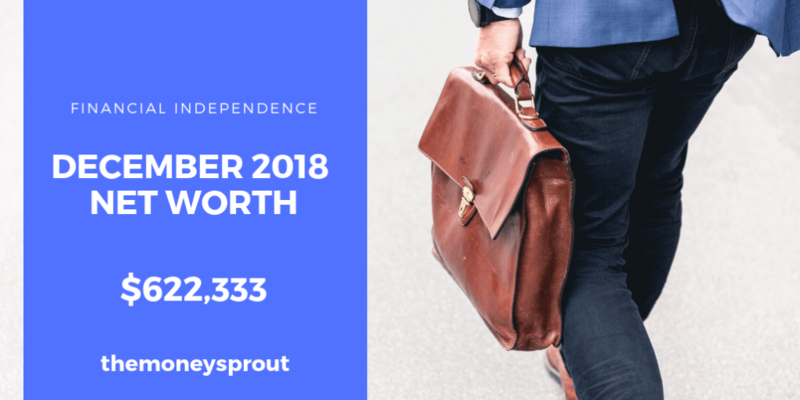 As of December 31st, 2018 – our net worth is $622,333. Overall, that is a good size drop of over $31,000 in net worth just in the last month. Since our all time net worth high back in September 2018, we are down just over $43,000 in net worth. That is a 6.5% decline since that time. Our net worth in December 2018 decreased by (4.84%) compared to November. During December, we saw a drop of almost $30,000 in investments alone … which is a direct result of recent stock market declines. The good news is that investments today are a little bit cheaper for any new money we put into the market. Overall, our investments dropped by (5.73%) in December compared to the prior month. Overall our cash declined by over $1,000. This is mostly just the timing of when our income hits our accounts and is used to either pay down debt or invest. Note – When it comes to cash … I find it a very inefficient way to build wealth. That is why we put it to good use either paying down debt or investing it whenever we can … even in a bad stock market! For example, we use Zillow to estimate our home value. This is simply an estimate at best and may not represent the actual value we could sell our home for. The estimated value of our home decreased several thousand dollars this past month compared to November. This size drop was a bit unexpected to be honest. But even last month I commented that if we could be guaranteed to sell our home for $330,000 today … I would take it. So the estimates I believe are skewed a bit to begin with. All three of our asset classes (investments, cash, and home) saw good size declines last month. Overall our total assets decreased by (4.23%) since last reporting … which was disappointing … but not unexpected. Like I mentioned before … it’s been a tough couple of months but we were up overall for the year. Eventually we will likely downsize into a much smaller home in order to reduce our housing expenses … which currently makes up 37% of our monthly spending. And we would have purchased a home closer to my work … to help save on transportation costs. And we paid for our January mortgage payment a few weeks early … so we actually made the equivalent of 2 payments in December. One of these loans is for our “family vehicle” (a van). This loan has a very low 1.56% interest rate and we are now less than 8 months from having it completely paid off. The second car loan (referred to as “Car Loan #2”) currently has about 4 years, 1 months until it is paid off. During December … we saw a nice drop in debt on both car loans. We expect to have car loan #1 paid off by next August (2019) at the latest. Overall, we were able to increase our net worth by almost $600! That $600 counts just as much towards growing our net worth as does a $600 increase in our investments. During December, we saw a good decrease in our month to month credit card balances. Since last reporting – our mortgage balance dropped, both auto loans dropped, and our credit card balances dropped. So there actually was a bright spot in our net worth report … despite the large declines in the stock market. Collectively our total liabilities decreased by $4,250! I look forward to paying off our auto debt so we can then use that extra cash to save. Now we are over $620,000+ in new worth … which is a sizable increase in less than 4 years. We also realize the huge gains in the stock market have helped us grow our net worth. Do you track your net worth? How did your December net worth totals turn out? What steps are you taking to widen the gap between your assets and liabilities?